Located on south side of McVey Ave. near Bickner St. Left to right: Henry Gans (Uncle John's uncle), Rose Gans, Clara Gans (Mother Bickner's sister), Mary Bickner, Lillian Gans, Doctor Sullivan. Taken in 1890 or 1891. Description Faded, pinhole, mounted on cardboard. 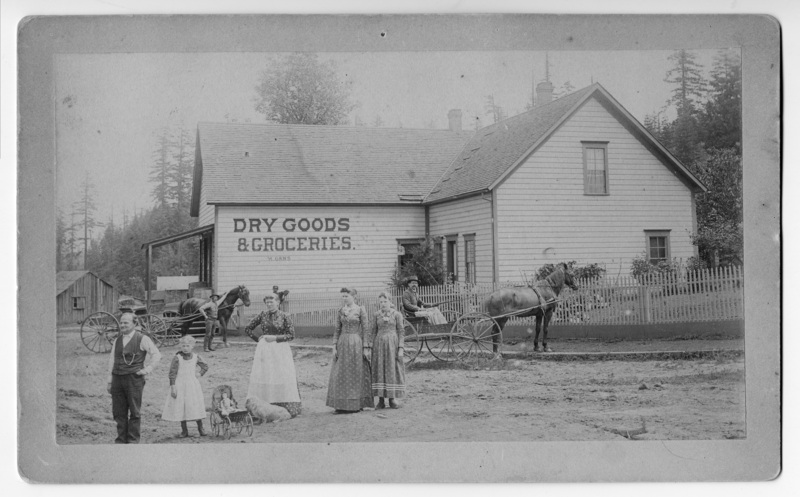 Same as 25b & c. Sign on building: Dry Good & Groceries, H. Gans. Transcription Located on south side of McVey Ave. near Bickner St. Left to right: Henry Gans (Uncle John's uncle), Rose Gans, Clara Gans (Mother Bickner's sister), Mary Bickner, Lillian Gans, Doctor Sullivan. Taken in 1890 or 1891. Physical Description H 5.25" X L 8.5"